The Exerpeutic 1000xl Magnetic Elliptical machine is yet another elliptical machine I have decided to look into it because of its affordability and useful features. We all already know that elliptical machines are known for their gentle nature on the ankles, knees, and the hips. Aside from being easy on these parts of the body, it also works on your lower and upper body with great impact. It tightens, tones, and strengthens the muscle groups of the body. Yet, it is very easy to use the machine. Exerpeutic 1000xl Magnetic Elliptical has 8 levels of magnetic resistance that was designed to challenge you and achieve results. The design is such that eliminates bouncy movement/motion while exercising. I always love fitness machines that have a target zone monitor; with this feature, you will always know when you have entered your heart rate target zone easily. This is one other feature that the Exerpeutic 1000xl Magnetic Elliptical machine has. This is found on the handlebars. How about being able to enjoy your workout without the interference of noise emanating from the very machine you are using. It will be soothing to have a smooth ride while working out and this is one thing this machine will also ensure. The LCD display is yet another feature that would allow you to easily see and read through your data such as, distance, calories burned, speed, time, and of course your heart rate zone. This is a perfect machine that offers a dual workout that targets the lower and upper body. That being said let’s have an overview of the features and pros of the Exerpeutic 1000xl Magnetic Elliptical machine. • Easy Transportation– It has transportation wheels that would make moving around easy. • Tension Resistance– It has 8 level magnetic tension resistance adjustments which provide the user with a more challenging workout for quick and better results. • Designed with Safety in Mind– To ensure safety and to prevent injury, the machine is adorned with a ribbed larger pedal to prevent slippage during a workout. • Display Console– A large LCD display window accompanied this machine to allow you to see the progress of your workout by way of showing the calories burned, time, distance, monitoring and scanning your target heart rate zone. • Workout Arms– Workout arms are dual action tools that provide you with an upper body workout and also the pulse pads that allow the monitoring of your heart rate zone possible. • Dual Direction Flywheel– This means it has a flywheel that is dual directional for frontwards and backward workout capabilities. • Dimensions– 54’’L x 23’’W x 63’’H and weighs about 76 pounds. 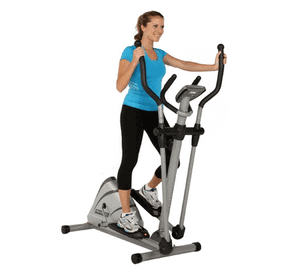 What’s so cool about Exerpeutic 1000xl Magnetic Elliptical Machine? It is affordable, which is great for people on a budget. Not only is it affordable but also sturdy and has got great features as aforementioned. It supports 300 pounds weight of a user, which means most people are likely to fit in; and, it’s a dual workout machine that targets the lower and upper body. I can just go on and on, but if you have read through the features above you would have more reasons why you should get Exerpeutic 1000xl Magnetic Elliptical. 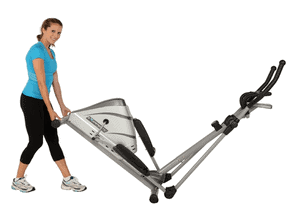 What’s not so cool about Exerpeutic 1000xl Magnetic Elliptical? Unfortunately, everything is never perfect except those made by God Himself! Thus, Exerpeutic 1000xl Magnetic Elliptical has got not so cool things about it. First, the stride is not so cool because it could be better. Taller individuals may not really find it great since its maximum stride is about 13’’ stride length, sorry about that! I will recommend this machine if you are on a budget and still looking for something that can still deliver in terms of comfort and results. Using this machine is a great way of staying fit and at the same time staying away from injury. Go grab yours now here.